West Indians during the Great Fire of Colon 1940. West Indians work together to put out the Great Fire of Colon 1940. Entire buildings were burned to the ground forcing West Indian tenants to migrate out of the city. The picture is of the Great Fire of Colon April 13-14, 1940. 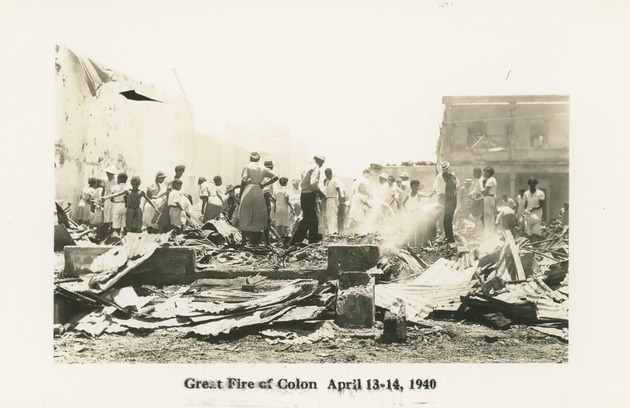 This photograph is centered on West Indians, it includes women and children, and it also shows the absolute destruction left behind by the Great Fire of Colon. This picture shows over thirty West Indians from side to side. Both male and female subjects can easily be identified as well as children of about six or seven at the youngest. Most of the subjects have their backs turned toward the photographer, showing concern for the remains left behind from the enormous fire. The caption at the bottom states, “Great Fire of Colon April 13-14, 1940” and it shows just that, entire buildings burned to the ground. Using one of the subjects as a scale, the buildings in the background that were left standing look about a block away from the photographer, speaking to the severity of the destruction caused. This photo belonged to Clifton Bondurant, who served in the U.S. Navy as a radio specialist during the war -- believed to be stationed at Coco Solo in 1934. Research and additional metadata (metadata is the citation information, including the alternate title, abstract, subject terms, abstract, added notes, and other item information) written and contributed in May 2014 by Alexandra Graham for course: “Panama Silver, Asian Gold: Migration, Money, and the Making of the Modern Caribbean” (Spring 2014, taught by Leah Rosenberg at the University of Florida).